Over the past few weeks the public has been voting so hard to secure spot of their favourite Eastern Cape stars, events and programs in order to book a space for the awards in July. Out of 98 correct entries, only 36 nominees will be able to go through to the main event in Guild Theatre on the 12th of July. Therefore, the top 3 most voted nominees will automatically go through to the second voting of the awards that will commerce midnight on the 1st of June until the 4th of July. This is a red carpet event that is expected to introduce a glance of what to expect at the awards in July, with local artists performing. The event will also be backed a lot of media coverage from radio, stations to our streaming publishing via BEATTV where all interviews will be available than in other sources. Entrance of R50 will be charged at the door, to reserve a space for yourself contact Yolanda at: yolandatoni30@gmail.com or events@beatmagazinesa.co.za. 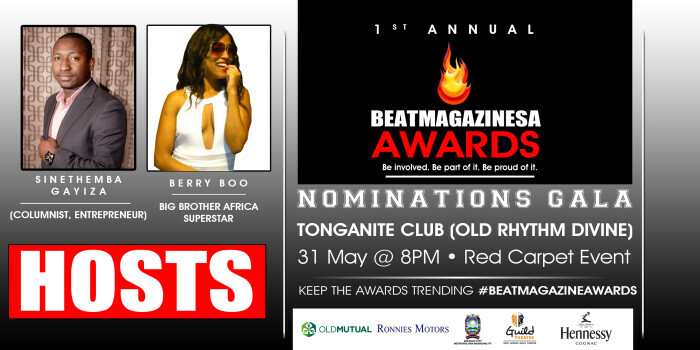 All participating nominees should RSVP at: beatawards@beatmagazinesa.co.za | Before 5pm tomorrow (30 May 2014). Hosts of the evening are: Sinethemba Gayiza (Columnist, Entrepreneur) and Berry Boo (Big Brother Africa Superstar), with entertainment from Zycho, Thix’Unathi, Lolo Vandal, Sizzle, Tsepiso Nzayo, Mbu Many Laughs, Zeeman (DJ of the night) and DJ Pocxman.